3 bedroom/2 bathroom villa on natural lake with solar screened west facing pool. The villa is decorated in pastel Florida colours, with light Spanish tiled floors throughout the living areas, giving a cool feel on hot summer days. The air conditioning is supplemented by ceiling fans in all main rooms. The open rear private west facing aspect provides views of magnificent sunsets. The area abounds in wildlife, so you could see the ducks "come a callin" for breakfast. 1 American 5ft Queen size with ensuite large walk in shower, toilet and separate washbasin area, TV, safe, portable telephone, bedside radio and patio doors to pool. There is also a family bathroom with toilet, handbasin, and bath with integeral shower. Each bathroom has a hairdryer plus curling tongs and a selection of towels, all linen included. The lounge opens via patio doors onto the pool deck. For your enjoyment there is a flat screened multi channel digital TV, a music centre and a large selection of books in the library. The internet is Xfinity and fast and has both WiFi and Ethernet connections. The phone has free USA calls. The lounge has 2 settees and 2 additional casual chairs. At the rear of the lounge is a formal dining area which seats 6. There is a large see through hatch into the kitchen which also has casual dining with a full length window bench seat. The kitchen features a electric hob/cooker, dishwasher, microwave, phone, large upright fridge freezer along with all the small appliances and utensils you would expect from a fully furnished kitchen. A separate utility room holds the washer, dryer along with ironing board and iron plus brooms etc,. The pool towels are also stored here. A door leads from here into the up and over garage. You will find that the padded loungers for the pool area are normally stored here. For your security the house has a audible security alarm system, plus electric smoke alarms fire extinguisher and emergency lights. Separate child alarm audio warnings are fitted to both patio doors. The pool deck has glass topped table and chairs and pool loungers together with a complete screened pool enclosure. The pool deck faces west over a large uninterrupted green grass area leading down to a natural lake, which is a mecca for many varieties of birds and wildlife. Fantastic sunsets!! The free solar pool heating can be supplemented with a chargeable electric heater during colder periods. Please note that smoking and pets are NOT allowed in the villa. We have helped many families over the years to enjoy their magical holiday in Florida. We would be delighted to be able to help you and your family achieve their dreams and enjoy a holiday of a lifetime. We both love Florida and the laid back Florida life style. We live in North Wales but spend as much time as we can in warm and sunny Florida. When you see the evening sunsets over the lake, you will know why this is a great place to come back too after a hectic fun filled day in the parks. Bathroom 1 is the master ensuite. It has a large walk in shower and toilet area and a separate room with washbasin and full mirrored wall with vanity spotlights. Each bathroom has a hairdryer plus curling tongs and a selection of towels. Bathroom 2 is the family bathroom with full tub and attached shower with glass sliding doors plus a washbasin and toilet. Air conditioning and ceiling fans in all main rooms. Change of bed linen, plus extra blankets and pillows provided for each bedroom. Pool towels, personal towels and all normal linen. Baby cot linen. The latest ECO washing machine is in the separate laundry room. FREE High speed road runner wifi with alternative Ethernet connections. Apple (new&old connections) charging station. USB charging port for non apple appliances. All bathrooms have large selection of towels and there are separate pool towels in the Laundry room. There are 2 dining areas. The first is the informal dining in the kitchen, which seats 6 comfortably, the second is a more formal dining area at the rear of the lounge, again seating 6 comfortably. There is a radio/CD/DVD player with USB connections and Bluetooth capability for playing your own music. Philips Radio/multi dock triple charger with original IPod/Ipad/Iphone connection PLUS new lightening connection for new Apple devices and a USB for Android/Tablets. There is a large selection of books. The west facing terrace surrounds the pool and has padded sun loungers, glass table & chairs for your relaxation. Though the villa is on the level, the doors to the bathrooms will not accommodate a wheelchair access. 30 foot by 15 foot fully screened and West facing solar heated pool. We have a local 24 hour contactable management company for your peace of mind. We arrived to find a very clean, organized and totally furnished villa. Everything was well maintained. The villa is centrally located with an easy on/off to everywhere you may want to go. Abundant shopping in the area. The enclosed pool area was most enjoyable with chairs, loungers, table/umbrella available. The kitchen was stocked with plenty of utensils, dishes, pots and pans. Very nice to have a dine in kitchen. We enjoyed puzzling on the other larger table in the living/dining area. The flooring was laminate or ceramic tile which was spotless. I loved the large laundry room with new full size washing machine and dryer. For our taste, the decor needs to be updated, but that is not an issue. The owners and Susan, the local property manager, were professional, most kind along with being very accommodating and always responsive. A gem in all ways. Thank you for the very honest and detailed report. We are always appreciative of feedback that can be read and used by future guests, to help make their choice of our holiday villa the right one. Yours ticked all the box's! Loved, loved, loved this place, pool was very warm 😀. Loved our stay at the house, i have nothing bad to say. Chris & Chris was very helpfull. A warm pool is very welcoming after a busy day hitting the attractions or shopping. Your Finnish comments were a nice finishing touch- thank you! Good house in a great location. It’s nice to be flattered every now and then! Glad we were able to assist you at the start of your stay. Your right about the villa location, many guests have commented on this. Beautiful Villa - will come back many times in the future. Great owners and Susan from the Management Company was extremely nice and helpful. We are so glad that your vacation was a memorable 5 star one .We and our management, always know that personal and immediate communication is all important when booking an unknown property. We look forward to welcoming you back to Florida. Fabulous villa and location - we loved it! We were so excited to see the villa as it is even better in reality. We truly felt home from home and were close to some many amenities and shops so that we could cook at home, relax and swim in the pool after long days at the parks. Everything was extremely close by and we managed a few days at Universal, Discovery Bay, Florida Mall and Cocoa Beach, the last being the furthest away at an hour. Universal and Disney were close and the driving to them was easy. We are so pleased that we chose this villa and Chris and Chris were superb in answering all of our questions (of which there were many!). 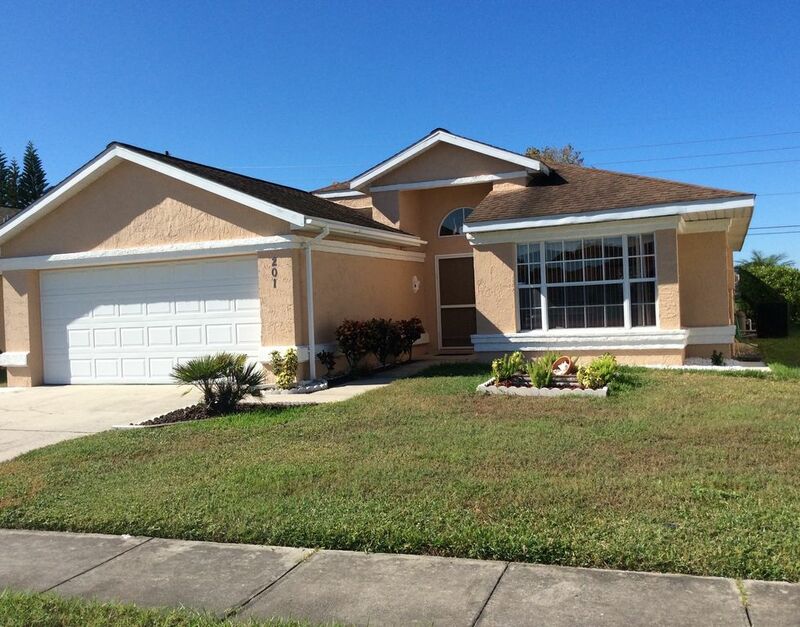 This quiet, safe neighbourhood is just off E Osceola Pkwy which has a direct connection into Disney, along with the other attractions of Sea World, Universal, Gator Land, Wet and Wild etc,. all 20 to 30 minutes drive away. A wide range of shops and restaurants are at the spectacular new LOOP shopping centre which is a 10 minute drive from the villa. There is also a 24 hour Walmart within 5 minutes and a large selection of golf course's in the Orlando area. Both the Gulf coast and Atlantic coast (Kennedy Space Centre) are approx 40/45 miles and a easy 40/50 minute drive. Lake Tohopekaliga is a 15 minute drive and has fishing, boat hire and airboat rides "to see the gators", along with a country style restaurant. 180 Designer outlet stores are located at the International Premium outlets some 20 minutes away at Lake Buena Vista. Check in time is 16.00 hours Check out time is 11.00 hours. Electric pool heat seasonal topup (if requested) $20 per night, 7 nights minimum. The front door key is provided via a lock box, details of which will be given along with all other security codes, on payment of final balance.